One of the things that has been quietly happening behind the scenes for Office 365 customers is that they have been receiving updates in a very efficient manner via Click-To-Run, rather than through traditional Microsoft/Windows Update. The monthly updates are pulled down as a delta, and can be deployed with very little impact to user productivity. In February 2016 there are some changes coming, and for those that are doing upgrades directly from Office 365 they will be automatically updated to a Pro Plus version of Office 2016, replacing their Office 2013 based edition. This only affects those who haven’t disabled automatic updates from the web, whereas those that are managed to pull from alternate sources or have upgrades disabled, this won’t immediately impact them. Up until now, you’ve been able to allow selected or all users to get access to Office 2016 installs via the First Release option. Below you can see a user who has the option to install Office 2013 and Office 2016 based versions of Pro Plus. There are some additional things that you need to be aware of, including a move towards a servicing model similar to what the Windows 10 team is doing with a Current Branch and Current Branch For Business options for separating feature updates out from security updates. Office 2016 will appear for many Office 365 users in February 2016 and you can control how, when and if these updates are applied. In this episode we explain the new Office 2016 servicing options and when feature updates will appear for your users. We recommend Office 365 admins get familiar with this process and update timelines. 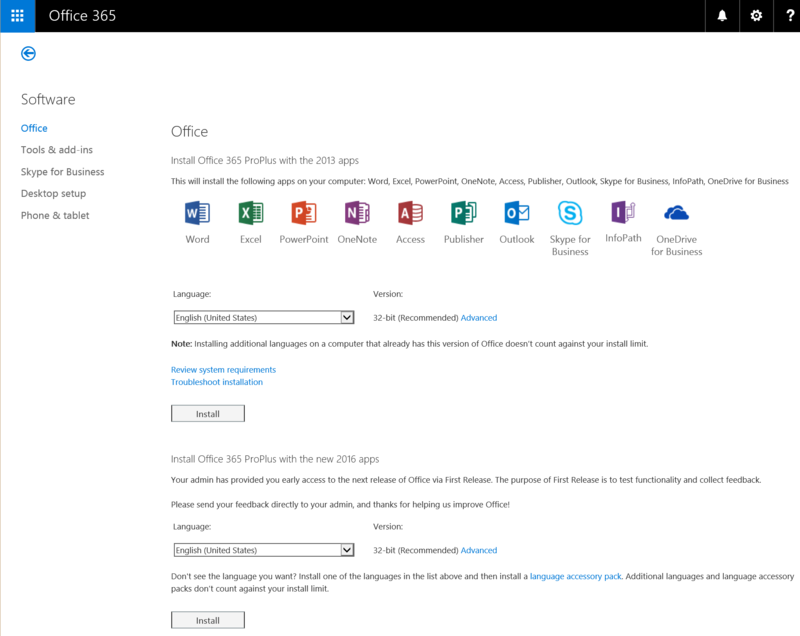 Office 365 ProPlus now includes the 2016 apps, and if you are an Office 365 administrator you’ll want to know how everything is getting rolled out and what you can do. – What your users will see and when. 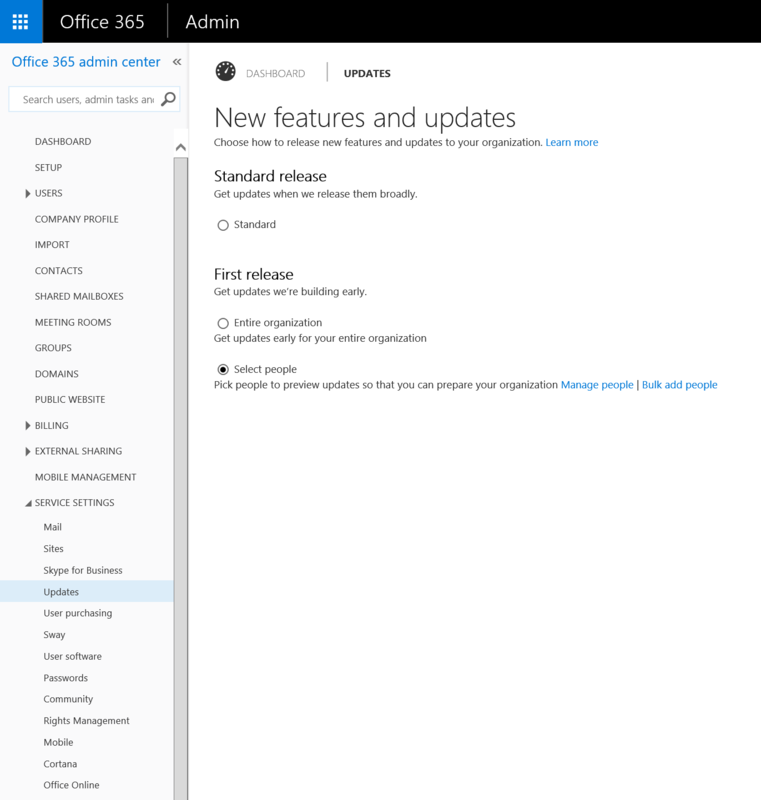 You should check out the Prepare to upgrade Office 365 ProPlus to the Office 2016 version page TechNet website, which should connect you to whatever additional information you need.